A little update from my Christmas greeting collection this year, I did actually make 14 different designs for Christmas card this year. There are 4 designs in Cookies jar series, 4 designs in Snow globe series plus addition Boy and Girl skate , for the small size cards. 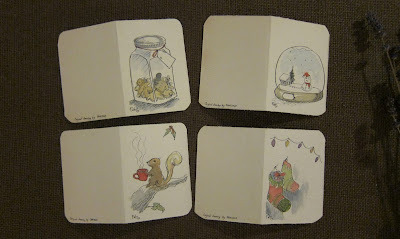 For every cards in small series are painted by hand. :-) I was having lot of fun while doing it. Cookies jar series. Yum yum! Boy and Girl skate, which have in both A6 and A7 size. And this is the designs for A6 size series, I call them personally "Bunny series" , they are bunny family enjoy their Christmas as we do. I make limited printed on this series with help from my kind friend in Bangkok. She made such a quality print for me, every card had printed on watercolour paper. Other than this, there are some card that actually original and had been sold before I took picture of it. And some I have only the photo of it now. This is belong to Elisabeth, one of my sweet friend. 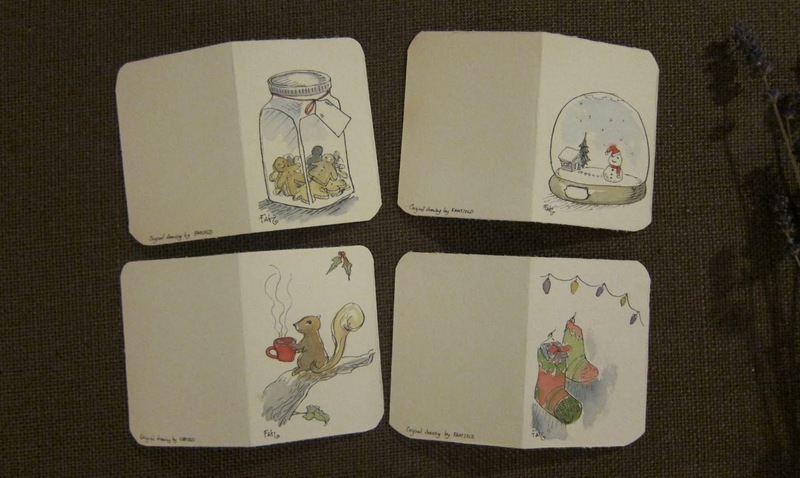 This is the prototype of 4 small card series, all sold already.